Intex Technologies, domestic manufacturer has upgrades it’s portfolio by launching, “Intex Aqua Marvel+ and Intex Swadesh” in the Android powered Smartphone segments of India. Both the two Smartphone with their full specifications were displayed on the company’s official website. Recently we have seen company has launched, “Intex Aqua Wonder 2 and Intex Player” in the gadgets hub and now again with two new elements Intex is looking all set to compete against the leading manufacturer in the Smartphone arena. Picking the first in the line up Intex Aqua Marvel+ which is the successor of Intex Aqua Marvel sports a descent 3.5-inch HVGA Touch Screen display with 320×480 of pixels resolution. Dealing with it’s Platform dependency, Intex Aqua Marvel + sails on the outdated Android 2.3.6 Android Gingerbread Operating System powered with a Single Core MTK6515 Single Core processor clocked at 1 GHz. This device is a Dual-SIM smartphone that supports GSM frequency on both the SIMs. In terms of Storage Specifications, Intex Aqua Marvel + is equipped with 256 MB of RAM, 95MB of internal memory which can be easily expandable up to 32 GB via micro SD card slot. Briefing it’s Connectivity Support, Intex Aqua Marvel + supports Bluetooth, Wi-Fi and USB ports. For camera, there is a 5-megapixel rear camera on board with optical zoom up to 4x and it also support video recording. To make the life going on for this handset, it comes with a 1400 mAh of battery with talktime up to 3 hrs and standby time up to 300 hrs respectively. To fascinate the buyer interest this handset will be available in three color variants mainly grey, white and yellow. The Price of Intex Aqua Marvel+ is Rs 3,990 and is available for sale on all the leading online retailers across the nations. Rotating the shaft towards the second element in the line up, Intex Swadesh market up at a Price tag Rs 3,790. Intex Aqua Swadesh flaunts a bit lower 3.2 inch of QVGA Touch Screen display with 240×320 of pixels resolutions. It also runs on the same old platform as we mentioned in Intex Aqua Marvel +. In terms of Photography Specifications, Intex Swadesh offered with a back camera rated at 2 MEGAPIXEL. Briefing it’s Storage Specifications, Intex Swadesh offered with 75 MB of internal storage which can be easily expandable up to 32GB with microSD card slot. To Power it up, 1200 mAh of battery with 3 hours of talktime and 120 hours of standby time. 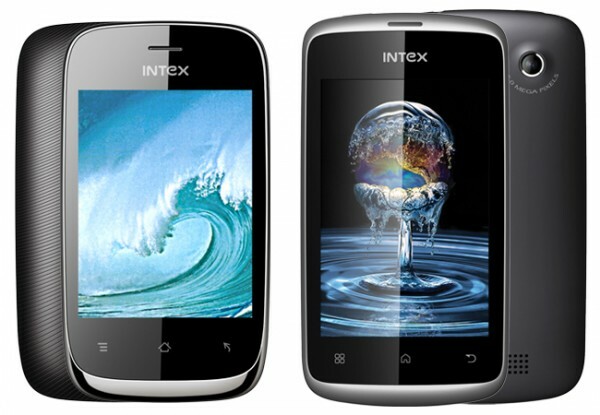 Intex Swadesh is available in black and white color variants. The Price of Intex Swadesh is Rs 3,790 and it is also available for sale on all the leading e-commerce retailers. One of the Leading Telecom service provider, "Aircel" in collaboration with,"Magicon"